How was your summer? It feels like fall here in Italy these days, and I'm feeling a bit nostalgic already, thinking how summer has come to an end. Anyway, I spent very nice couple of weeks at my favorite island in Croatia, Rab. I already mentioned how that's my favorite place for summer vacations as it's very relaxing, (almost) always sunny & warm, and with beautiful beaches and breathtaking sites! 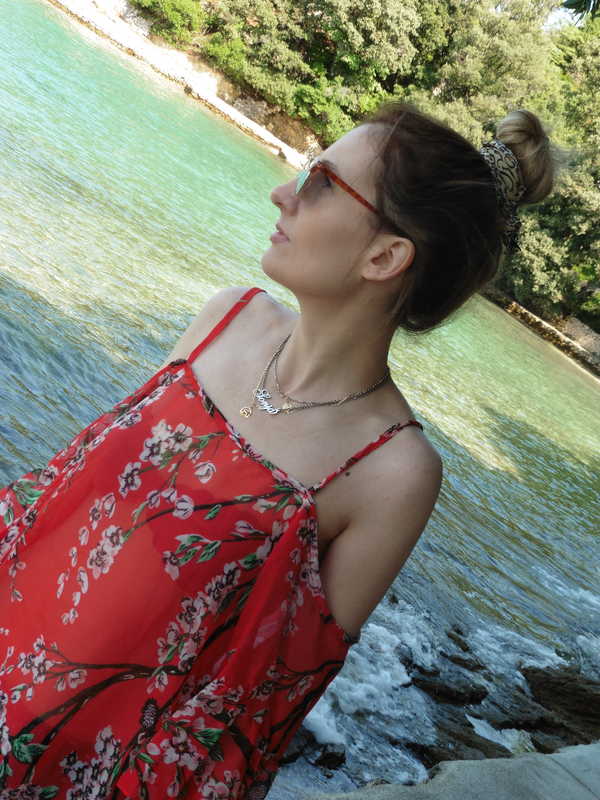 In this post I'm going to share with you an outfit that I wore to the beach - do let me know how you like it in the comments below. In my wardrobe I have many beach dresses and this summer, I liked this red one with floral print. I got it somewhere online, for just a couple of $$. It's a bit see through, so it's ideal as a bikini cover up. I like it because it's flowy and breezy so it's ideal for summer heat! I'm also loving the cute flower print which is on trend. I accessorized this look with my must-have summer jewelry: colorful bracelets, seashells and a wooden Konifer watch. I pulled my hair up in an effortless bun and tied a silk scarf by Guess. This summer, silk scarves in your hair are a big trend, and you can wear them many different ways: sometimes I wrap them around my pony tail, or sometimes I'll incorporate them into my braid. They're so chic and easy solution when you don't really know what to do with your hair! Here's a little family selfie. 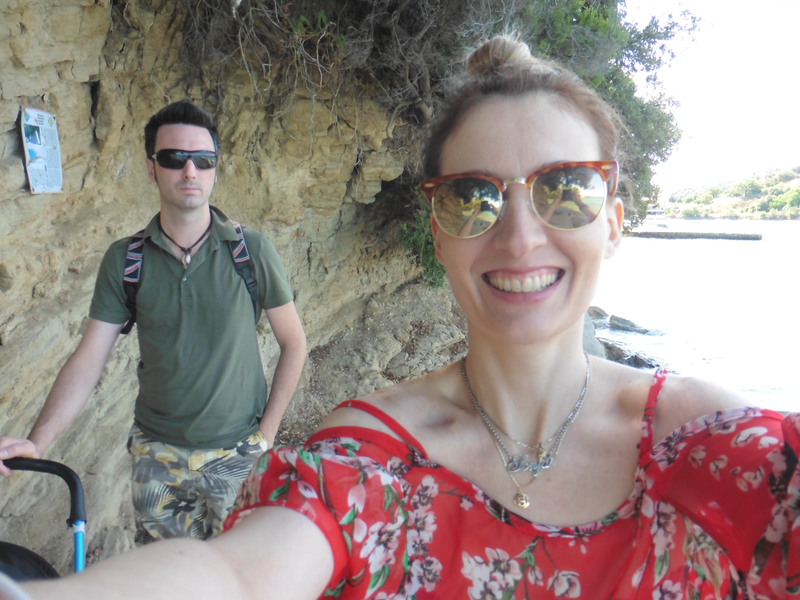 We've had such a lovely holiday and we already miss being at the island of Rab! Here we are at the Gonar location, one of our favorite spots at the island, along with Suha Punta. If you ever have a chance to visit Croatia, make sure to stop by Rab, I'm sure that you'll love it! I've been struggling a bit lately with keeping up with blogging/ vlogging, as I'm a working mum of a toddler! But I do still have a passion and will to film/ blog, so I'll try to find a way to keep doing what I love! Sometimes it can be quite frustrating, not being able to give 100% and create a great quality content that would satisfy the standars I've set for myself, but I just have to remember that I'm doing this out of passion. I don't have a team of people working for me on creating content and promoting it on social medias, and at this point in my life, my ray of sunshine is my little son and he is my top priority! I don't want to miss out on anything, and time really do flies by so quickly and they grow so fast. I want to enjoy him to the fullest. Family first, then comes blog. I hope you understand. Let me know all about how was your summer and what are you up to this fall? Ma che carino, con questo abitino siamo ancora in estate. Buona serata. I am also feeling nostalgic for the summer months. And I love love love that outfit. The colour looks incredible on you. In summer I was on holiday in Italy and I miss Italy. But now is everywhere autumn. Fall is in the air! And now, what to wear? How to get best deals from on-line shopping? Moonstone rings, my new passion!